I loved the idea of this project from the beginning, over a year ago now. It set a seed, inspired me to look towards from a difficult time, into the future, a place I hoped to reach. Sometimes you don’t know why you do, you don’t even know if you can, you just know you have to. 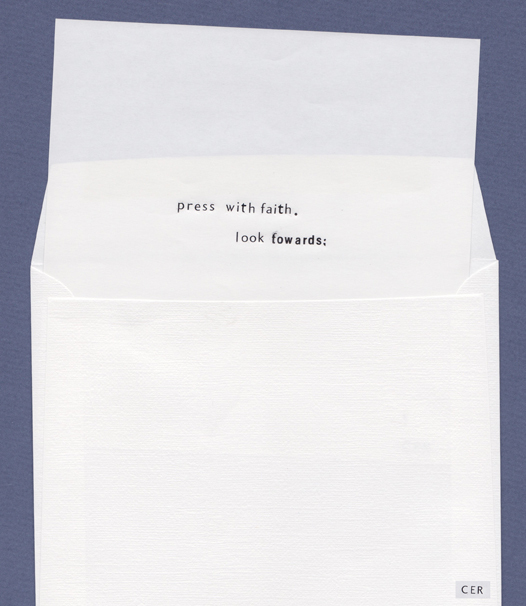 You press faith into faith, and hope the meaning will come clear. You keep laying each mark, and trying to build. Through a series of connections, you begin to make up a whole. Throwing stars at the moon, hoping to leave a pattern. This project itself is a journey of many parts, gaining more resonance and a sense of itself as it moves on. Each bone in the spine is essential. I love to think of how long it might stretch. This small composition forms part of what I hope to be a larger piece of music, this is a sketch of something slowly evolving, but somehow as it has grown with me since the seed of Emily’s project began, when I first saw the photograph and started to sing, it seemed perfect to post the first part of its journey here. 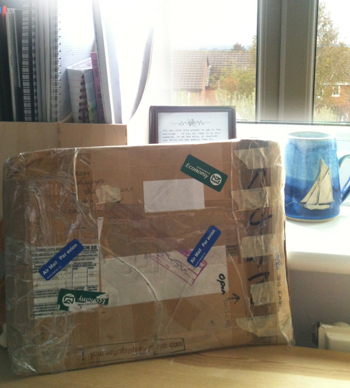 I’ll now send off the package, with a note to join the others, on to its next. A small part of me travels too.. This package was such fun to open. Thankyou Emily! This entry was posted in Uncategorized and tagged art project, Cath Rennie, collaboration, journey, journey of a photograph, Music, photography, Train, travel by settleandchase. Bookmark the permalink. Oh that’s good to hear, thanks. It was really great to take part! A brilliant and unique continuation of the photograph’s journey. Absolutely lovely – I’m so looking forward to hearing more! I really like the tension between the technology and your voice – it reminds me of getting lost in the woods at a birthday party in the 70s. Ha that’s brilliant – it’s funny, people often comment on the 60’s/70’s vibe in my music – I can’t quite hear it myself but it must be in there somehow as it comes up all the time! I hope you were found soon in your wood! 🙂 Thanks Richard. I agree with the former comments. Lovely! I also love the sentence ‘each bone in the spine is essential’. Hi Cath. From someone who has faced some difficult challenges in the last few years, your written words, visual images and sounds are understood. I especially love the stars, one star at a time leading to freedom 🙂 A lot of thought went into this piece. Axtelera Ray then under videos. scroll down to guys sitting on bikes with their arms stretched out and watch video. I didn’t have the sound on but I thought you might like to see it. HI Carla, thanks so much for posting that – I love it. Can’t begin to imagine how long it took. I’m so glad you connected with my post – always a concern with such a personal response that it might be too personal and not come across. But I hoped it would translate. Thankyou! !